For hundreds of years Canterbury has been a place of pilgrimage, but for one band it was the place from which they set out on a pilgrimage into Prog. The band was Caravan, and it all began back in 1968 when David Sinclair, Richard Sinclair, Pye Hastings and Richard Coughlan met - all four had been in the Wilde Flowers, contemporaries of Soft Machine and the two most famous bands in 'the 'Canterbury Scene'. Caravan signed to American label, Verve Records, not the expected route for a Prog band to take, but there's always been a strong hint of jazz in their music; music that is for thinkers, more than toe-tappers. After releasing their debut album in late 1968, simply called Caravan, they became a fixture on Britain's burgeoning underground scene. It was 1970 before they released their follow up, the oddly titled If I Could Do It All Over Again, I'd Do It All Over You and with Verve getting out of the rock and pop business and once again concentrating on jazz, Caravan had signed to Decca Records. Decca, anxious to see their new signing have some success, released the title song of the album as a single and Caravan appeared on Top of the Pops, their first of three TV appearances on the flagship BBC show. Even a casual listen to this album shows they are no pop band, with tracks that include the fabulous 'Can't Be Long Now', a fourteen minute work out that set out their prog rock stall for all to hear, with David Sinclair's trademark keyboard sound and part-time member, Jimmy Hastings, Pye's brother's jazz tinged saxophone. 'Can't Be long Now' is actually a four song suite that includes 'For Richard' that became a standout song of their live set, as it still is today. 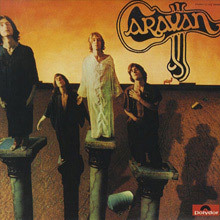 In 1971, Caravan signed to Decca's subsidiary label Deram to record their third album. In the music business there's a phrase, "the difficult third album", for Caravan it proved anything but. 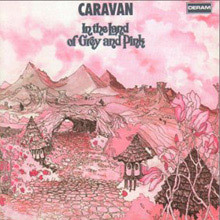 In The Land of Grey and Pink, with its grey and pink Tolkienesque cover art that oozed Prog, the band produced a stunning album, full of majestic, sweeping, melodies, quirky lyrics and the obligatory, in those progtastic halcyon days, one side devoted to a continuous musical piece; in Caravan's case, the soaring, 'Nine Feet Underground'. This is one of the great Prog Rock albums and if you were looking for a place to start your journey into this magical and mystical music, look no further. It is full of accessible melodies and superb musicianship that combines both jazz and English classical music influences. Then David Sinclair left the band, the man who for some was the sound of Caravan briefly joined Matching Mole, then Hatfield and the North before returning to the band, but not before they recorded Waterloo Lily in 1972 with new keyboard player Steve Miller (not the Californian guitarist and bandleader though). With it's cover art taken from "The Tavern Scene" from A Rake's Progress by William Hogarth this is a much more jazz influenced album than any of their others, thanks to Miller. 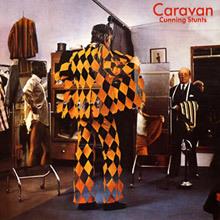 Let not this minor detail put you off in any way, it is an album full of what Caravan has always done best, with Pye Hastings vocals and guitar to the fore. 'The Love In Your Eye' is the standout track and one that became a featured track for many years in concert. Come 1973 and David Sinclair was back behind the keyboards for the provocatively entitled For Girls That Grow Plump in the Night; it originally had a provocative cover too, as the pregnant girl was naked, before Deram insisted she cover up. By this time, bass playing Richard Sinclair had left and joining Hastings, David Sinclair and drummer Richard Coughlin was violinist and guitar player Geoffrey Richardson. The latter's viola can be heard on the album's opening track, the mighty 'Memory Lane Hugh/Headloss'. It's another of the band's regal and imposing numbers that remains a firm favourite for the Caravanista. The album closes with another extended track based around the theme, 'L' Auberge du Sanglier' that helps to make this a rival for In The Land of Grey and Pink as the best album among the band's fans. A number of Britain's best contemporary jazz musicians are on the album, including, saxophonists Tony Coe, Harry Klein and Pete King, along with trumpeter Henry Lowther who among others played with John Mayall, Bryan Ferry, Jack Bruce and Talk, Talk. For their sixth studio album, the spooneristically entitled Cunning Stunts, the band were joined by a new bass player, Mike Wedgwood, who had been in the Overlanders and Curved Air. This was another album to feature a track taking up all of one side of the LP; the epic, 'The Dabsong Conshirtoe'. While proving to be less of a fan's favourite it did manage to make No.124 in theBillboard album charts and No.50 in the UK. Much of their success was based on a very fulsome touring schedule and the year before Cunning Stunts came out they released Caravan and the New Symphonia (1974). From the same year, but not released until 2002, was Live at the Fairfield Halls, 1974. 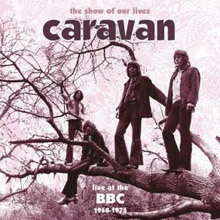 In 2007 The Show of Our Lives - Caravan at the BBC 1968 - 1975 is evidence of their popularity as a 'live' band on the many BBC shows that featured sets by bands on numerous shows, including John Peel's Top Gear, the In Concert programme and their three Top of the Pops appearances. For their seventh studio release, Caravan were once again with David Sinclair and the record, Blind Dog at St Dunstans, despite becoming a minor hit on the UK album charts was not popular with traditional fans as it messed with the formula; gone was Prog, in was more pop sounding material. It also heralded the band disbanding for a couple of years before reforming in 1980, with Sinclair back on keyboards. In truth it marked the end of the band as an interesting and vital studio-recording outfit, despite four more releases. Nothing, however, could stop Caravan from being popular live attraction in the UK and especially in Continental Europe where they have always had a large following. There have been a dozen live albums released over the last 30 years, many of which feature the music from their glorious reign as one of Prog's finest band. In 2010, to celebrate this era out came The World Is Yours - The Anthology (1968-1976). It features their best recordings, some demos, live tracks and is an essential purchase, not just for Caravan fans but for anyone wanting to understand just a little bit more about what made Prog, and the Canterbury sound in particular, so appealing. Fresh from his landmark remastering of the King Crimson back catalog, Porcupine Tree's Steve Wilson now takes on one of the most beloved, and eccentric prog albums of them all. In The Land of Grey and Pink is probably Caravan's finest hour (although For Girls Who Grow Plump runs it close), and back in the days when every sensible music buyer played his music on headphones, it served up a sensory experience that few others could match. For those reasons alone, the creation of a 5.1 mix would appear a no-brainer, and so it proves to be. No less than throughout the Crimson collection, Wilson delves deep into the master tapes, pulling out the flourishes that ears weren't even dimly aware of in the past, but does so without impacting the integrity of the listeners' own memories -- a trick that David Bowie (Station to Station) and Mike Oldfield (Ommadawn) would both have done well to heed. A good surround sound remix does its duty by remaining true to the original sound; a bad one just cuts things up and throws them in the air. This one is good, with the side-long epic "Nine Feet Underground" naturally taking the lion's share of the plaudits, but even the album's "lesser" songs (the opening "Golf Girl," the title track) benefit from the process, while the outtake "Frozen Rose" emerges, too, as a understated jewel. Add video footage of a two-song German TV performance taped for the album's release, and disc three of this three-disc package is worth the cost of admission in its own right. There is more, however. Disc one serves up the original album in stereo, with bonus tracks "Frozen Rose," the first version of "Love to Love You," and a none-too-essential, but gorgeously radical alternate mix of "Nine Feet Underground" worked up by Wilson in 2011. Disc two creaks beneath the weight of half-a-dozen alternate versions, a three-song BBC radio session, and a couple of track from Caravan's BBC radio concert a month after the album's release. A handsome fold-out digipack and an excellent 20-page booklet complete the package, and it doesn't matter how many times you have bought this album in the past. It's time to buy it again. For their first album, Caravan was surprisingly strong. While steeped in the same British psychedelia that informed bands such as Love Children, Pink Floyd, and Tomorrow, Caravan relates a freedom of spirit and mischief along the lines of Giles, Giles & Fripp or Gong. The band's roots can be traced to a British blue-eyed soul combo called the Wilde Flowers. Among the luminaries to have passed through this Caravan precursor were Robert Wyatt, Kevin Ayers, and Hugh Hopper and Brian Hopper (pre-Soft Machine, naturally). By the spring of 1968, Caravan had settled nicely into a quartet consisting of Pye Hastings (guitar/bass/vocals), Richard Coughlan (drums), David Sinclair (organ/vocals), and Richard Sinclair (bass/guitar/vocals). Inspired by the notoriety and acclaim that Soft Machine encountered during the burgeoning days of London's underground scene, Caravan began a residency at the Middle Earth club. Additionally, the band was shopping a homemade demo tape around to local record companies. Before long, entrepreneur Tony Cox worked out a deal for them to record on the newly founded U.K. division of the Verve label. Caravan's self-titled debut is equally as inventive and infinitely more subtle than the Soft Machine's Volume One or Pink Floyd's Piper at the Gates of Dawn. Two of the album's best tunes -- the ethereal "Place of My Own" was backed with the dreamlike "Magic Man" -- were issued as the band's first single. 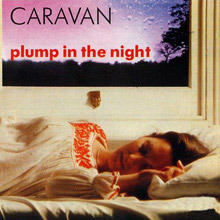 Those tracks accurately exemplify the subtle complexities that Caravan would hone to great effect on later recordings. The same can also be said for album cuts such as "Love Song With Flute" and the extended nine-minute "Where but for Caravan Would I?" 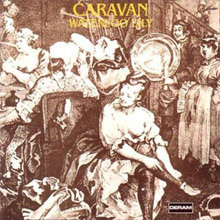 The latter title aptly exemplifies Caravan's decidedly less than turgid attitude toward themselves -- a refreshing contrast from the temperamental and serious Art School approach adopted by Pink Floyd and the Moody Blues. The mono and stereo mixes of the long-player are striking in their disparities. The stereo mix is at times opaque and virtually swallows the vocals most specifically on the tracks "Policeman" and "Grandma's Lawn." Otherwise, there are numerous additional nuances that discern the two. The single version of "Hello Hello" is also included as a bonus. This track was the follow-up 45 to "Place of My Own" and would appear in a slightly different form on their next LP, If I Could Do It All Over Again, I'd Do It All Over You. Potential consumers should note that the sound quality on this package is indescribably better than the HTD Records 1996 CD pressing. Before the recording of Waterloo Lily, David Sinclair departed Caravan to join forces with Soft Machine skinsman Robert Wyatt and form Matching Mole. With the subsequent arrival of former Delivery member Steve Miller and an overwhelming jazz influence, the edgier progressive rock and folk elements that were so prevalent on their previous albums are somewhat repressed. The band's performance level did not suffer in the transition. In fact, the addition of Miller only punctuates Caravan's previously honed improvisational skills. Beginning with Waterloo Lily's leadoff title track, there is a sound more akin to the jazzier efforts of Traffic. Miller's "Nothing at All" incorporates the jazz fusion even further as the long instrumental introduction more than hints at Steely Dan circa Katy Lied. The up-tempo staccato bop featuring Miller's electric piano accents, when juxtaposed with Pye Hastings' liquid-toned electric guitar could easily be mistaken for that of Walter Becker and Donald Fagan. The remainder of the album centers on a couple of pieces that evoke the sound and spirit of the previous Caravan outings. Most reminiscent of the classic sound is Hastings' epic "The Love in Your Eye" suite. The track recalls the laid-back intensity and phenomenal improvisational synergy of earlier tracks such as "For Richard" and "Where, but for Caravan Would I," while wisely incorporating Miller's formidable jazz chops to give the instrumental sections sustained substance throughout. The remastered CD offers three additional compositions circa the Waterloo Lily sessions. "Pye's June Thing" and "Ferdinand" are two of Hastings' acoustic demos. A considerably more complete "Looking Left, Looking Right" is a treasured recovery from the vaults. Originally vaulted due to the time limitations of vinyl, this track, along with "Pye's Loop" -- which acts as a coda to "Looking Left..." -- mark their debut release here. 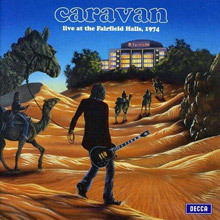 Documented during an era in which U.K. performances by Caravan were few and far between, Live at the Fairfield Halls 1974 is a brilliantly remastered and likewise complete presentation of a concert held just prior to their inaugural tour of North America. Although Caravan had been subjected to several key personnel and managerial alterations in the preceding months, once they hit the stage they shed any behind-the-scenes acrimony and were transformed into a stunning synergy of progressive and symphonic rock. This warm-up show took place on September 1, 1974, at Fairfield Hall in Croydon and was initially documented as a possible promotional tool for their upcoming stateside appearances. The tapes remained on deposit, seemingly forgotten, at the Decca studios storage facility in West Hampstead, U.K., until the stunning 19-minute "For Richard" was resurrected for inclusion on the two-LP Canterbury Tales compilation in 1976. Then, in 1980, the French budget label Kingdom Records issued a double album under the title The Best of Caravan Live. All but the most keen-eyed and -eared enthusiasts passed the set up as a poorly assembled hits package. It was, however, this show sans "Chance of a Lifetime" -- which the band rarely ever performed. Then as mysteriously as it appeared it was deleted and remains out of print. On this release, the sound has been sonically scrubbed and is now presented faithful to the original presentation. Enthusiasts who prefer the band's lineup and subsequent edgier tone, circa For Girls Who Grow Plump in the Night, will be doubly thrilled with this release as they re-create most of the album. Additionally, they wrap themselves around the crushing "Memory Lain, Hugh"/"Headloss" opener. Perhaps foreshadowing how powerful this rendition will be, the evening's proceedings fade in to the hovering resonation of Geoffrey Richardson's electric viola as he fiddles underneath the band's introduction. Caravan's most recent release concurrent to this performance is the equally impressive Caravan & the New Symphonia. From that disc comes "Virgin on the Ridiculous" -- performed here by just the quintet. Although composed for the incorporation of an orchestra, this rendition is leaner and displays the band's almost conversational way of jamming and improvising. The transition into the "Be Alright Now" suite is seamless, and, under the thunder sticks of Richard Coughlan (drums), the band is propelled into one of the only live versions of the medley to have been professionally documented. With a well-deserved nod to the "New Symphonia," Live at the Fairfield Halls 1974 will perhaps become the quintessential live Caravan release. The sound is crisp and the stereo image is direct and very warm. This disc is highly recommended for newly found fans as well as the more seasoned consumer. This 4 CD Box Set which was released in 2010. The albums have been re-mastered and the CD’s feature previously unreleased studio recordings, album tracks, different single mixes as well as a book with previously unseen photos. It also includes most of the entire classic album In the Land of Grey and Pink and is a must for any fan of Prog and also the ‘Canterbury Sound’. It has been extremely well reviewed by collectors and fans and as one reviewer called it – "simply awesome". 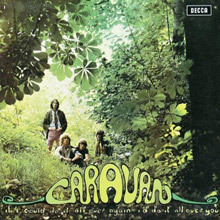 Caravan followed up their eponymous debut with the cryptically titled If I Could Do It All Over Again I'd Do It All Over You in the fall of 1970. If I Could Do It All Over Again contains significant progressions over the first album. These include the intricacy with which compositions are sculpted around some of the finest instrumental improvisation in British rock at the time -- or arguably since. Caravan's uncanny ability to create a montage that effortlessly maneuvers through acoustic folk and electric progressive rock is best exemplified on the "With an Ear to the Ground" suite. The extended instrumental passages weave in and out of each other, creating a hypnotic and otherwise psychedelic soundscape that would become a trademark of the European progressive rock movement. Another epic, "For Richard" quickly found solid standing as the Caravan live performance closer for decades after first appearing on this album. Juxtaposed against these pieces are several shorter works, which in essence clear the palette for the longer ones. 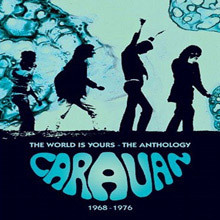 The title track, as well as "Hello, Hello" are perfect examples of how Caravan was able to one-up many of their progressive contemporaries, creating shorter and more accessible songs for radio airplay -- resulting in a guest appearance on BBC TV's Top of the Pops program. Instead of commencing the affair with the aggression and spirit that informed previous LPs -- such as "Memory Lain, Hugh" or "Waterloo Lilly" -- which had christened their earlier albums, "The Show of Our Lives" comes off comparatively heavy and practically dirge-like. Caravan's trademark instrumental agility while perhaps temporarily mired, is not lost on Pye Hastings' uptempo rocker "Stuck in a Hole." Heavy-handed, superfluous orchestration -- possibly a residual effect of their New Symphonia project from late 1973 -- mars "No Backstage Pass" and the 18-minute "Dabsong Conshirtoe." There are a few trademark and at times edgier passages, especially during the "Ben Karratt Rides Again" movement of the epic "Conshirtoe." Still, the orchestration is too slick sounding, as if it were teetering on the aural wallpaper that is (gasp!) Muzak. Caravan enthusiasts intent on including Cunning Stunts in their collections should be aware that the 2001 CD reissue contains a few choice supplementary selections. Chief among these is an unissued take of "Keeping Back My Love" -- which would ultimately be reworked three years later on Better by Far (1977). Here the band definitely display signs and sounds of the Caravan of old. For that cut alone, the renovated offering can be sufficiently recommended. The other significant bonus track is a live "For Richard" recorded at Fairfield Hall in Croydon, England. Originally, it was included on the 1976 Canterbury Tales best-of, but makes its digital debut here. While this two-CD, nearly two-and-a-half-hour collection doesn't include all of Caravan's BBC recordings, it's indisputably the finest collection of the band's radio performances yet assembled. It doesn't quite include all of the BBC tracks that have appeared on previous releases; a couple songs from their first 1968 session are missing, as are most of the cuts from the Ether Way: BBC Sessions 1975-77 compilation. This is more than compensated for, however, by the inclusion of a half-hour August 2, 1973 session that appears for the first time anywhere on this anthology, as well as the much-improved fidelity on some material first issued as part of the Green Bottles for Marjorie: The Lost BBC Sessions set. Too, the absence of some mid- to late-'70s material isn't a big blow, as it was during the period covered by this collection, in which Caravan were truly at their peak. As for the music itself, while these tracks aren't radically different from the more familiar studio versions, they're fine testimony to the band's ability to deliver complex progressive rock with deft spontaneity in a live setting. The first disc is far more impressive than the second, the band sounding like a cousin to early Soft Machine (with whom, of course, they shared deep roots) in their ability to make the transition from psychedelia to progressive rock sound playful, humane, and for the most part, based in strong songs and vocals. The most pleasing treasure is their fine nine-minute stretched-out cover of the early Soft Machine B-side "Feelin', Reelin', Squealin,'" which Caravan never recorded on their studio releases. The second disc, alas, finds the group becoming steadily less interesting with the onset of several personnel changes, documenting the band's (and indeed the entire serious British progressive rock genre's) growing inclination toward slicker virtuosity and less acute, distinguished songwriting. Nonetheless, the better portions are delightful and Mark Powell's annotation (which almost amounts to a band history in itself) excellent, and the compilation as a whole belongs in every serious Caravan fan's collection.